I know we ran short on time last meeting and things got rushed at the end. I just want to follow-up on a couple things that I don't think came across very well. I shared my concerns on allowing bees to raise emergency queens as a part of making splits. This is due to the fact that they must thin out royal jelly and float the larvae out of the cell so that it can be raised vertical vs. horizontal. 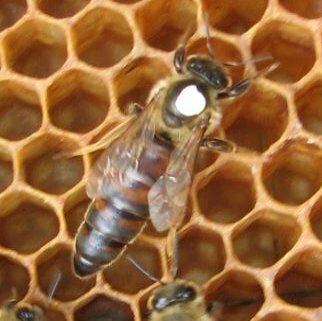 This thinning of the royal jelly happens at the most critical time of development, where the food they are fed determines whether they will become a queen, or a worker. I was not trying to imply that you have to buy queens or take on grafting. There is a method called "on the spot" (OTS) queen rearing where your hive tool is used to break open the bottom cell walls, eliminating the need for floating the larvae on thinned out royal jelly. If your interested you can find more info on the internet, or we can discuss this as a future topic with the BeeGroup. Also, let the mother hive build your cells, they have an abundance of resources needed to create high quality queens. Splits or nucs have a lot less bees, resources, and are marginal at best. Remember, even marginal queens can perform well in the summer , when all conditions are at the best. It is when Fall comes that the poor queens fail, when you need them the most. I hope to have virgin and mated queens available starting next month for those not comfortable with raising their own. This months discussion will focus around queen rearing and varietal honey. We will review the pros and cons of marking your queens, as well as having drones available for folks to give it a hands-on try. We will also discuss the when, why, where of collecting honey whether it is for varietal crops like apple blossom and clover, or if you will just be collecting "wildflower" honey. We are fortunate enough to have commercial beekeeper Anthony Heaney as a member of the BeeGroup who will share his knowledge on the subject. We put a short video together of a successful swarm trap catch. I think many will find it very informative to see how quickly a swarm can build comb. Check out the video -> HERE. Enjoy!